If you’re a nurse that doesn’t get to travel much, switch it up. Go somewhere new, experience different things. Below are some cities that know how to do Mother’s Day right. Head there this month and celebrate in style. The Big Apple makes a big deal every Mother’s Day, helping you celebrating throughout the city. Start the day with a brunch to remember at the famous Rainbow Room at Rockefeller Plaza where every mom receives a free gift. Spend the rest of your afternoon in Central Park. Whether at the zoo or lounging in the lawn, it doesn’t get much better than that. The holiday celebrating moms actually began in the city of Philadelphia, so it is not surprising that they take it very seriously. A favorite spot for Mother’s Day brunch is the decadent Chez Colette inside the Sofitel Hotel. Every May, they roll out the red carpet to welcome moms with a raw bar, carving station, full dessert tray and even a Bloody Mary bar. Yum. If you prefer something a little less fancy while in the City of Liberty, then head down to Germantown Avenue for lunch at the Paris Bistro or enjoy some surf and turf aboard the Moshulu on the waterfront. You can work off your meal by renting a bike at one of the 60 stations throughout the city and taking a leisurely ride through the historic Fairmount Park or along the Schuylkill River. It could be your kind of town for Mother’s Day. The city often sponsors a 5k run/walk for moms looking to do something worthwhile. After your workout, head over to the Pump Room for some old Hollywood glamor and homemade doughnuts. The Crystal Ballroom is treating moms to a jazz brunch that you won’t want to miss. After lunch, get a family photo at the Bean in Millennium Park. Add the Capital City to your assignment options this Mother’s Day. 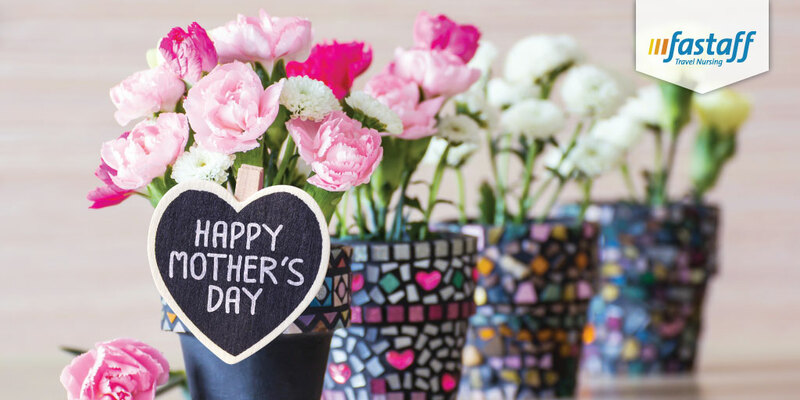 In Washington D.C., you have many sightseeing options and most are free, but the city has a few special Mother’s Day events to enjoy. Tour the over 80 art studios at the Torpedo Factory Art Center in Alexandria after you eat. You might plan on spending most of your day here, because there is a lot to see. If art isn’t your thing, try taking in a game at National park and you might see your name in lights as the stadium honors moms with a special Mother’s Day greeting. You work on the road as a travel nurse; learn to celebrate there, too. Spend this Mother’s Day in one the nation’s top cities and enjoy.